Our study was the first poll to focus solely on eminent evolutionists and their views of religion. As a dissertation project, one of us (Graffin) prepared and sent a detailed questionnaire on evolution and religion to 271 professional evolutionary scientists elected to membership in 28 honorific national academies around the world, and 149 (55 percent) answered the questionnaire. All of them listed evolution (specifically organismic), phylogenetics, population biology/genetics, paleontology/paleoecology/paleobiology, systematics, organismal adaptation or fitness as at least one of their research interests. Graffin also interviewed 12 prestigious evolutionists from the sample group on the relation between modern evolutionary biology and religion. Perhaps the most revealing question in the poll asked the respondent to choose the letter that most closely represented where her views belonged on a ternary diagram. The great majority of the evolutionists polled (78 percent) chose A, billing themselves as pure naturalists. Only two out of 149 described themselves as full theists (F), two as more theist than naturalist (D) and three as theistic naturalists (B). Taken together, the advocacy of any degree of theism is the lowest percentage measured in any poll of biologists' beliefs so far (4.7 percent). No evolutionary scientists in this study chose pure deism (I), but the deistic side of the diagram is heavy compared to the theistic side. Eleven respondents chose C, and 10 chose other regions on the right side of the diagram (E, H or J). Most evolutionary scientists who billed themselves as believers in God were deists (21) rather than theists (7). 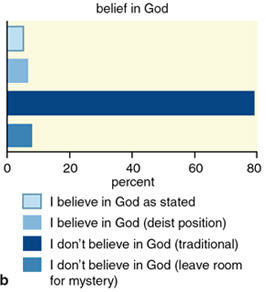 When asked directly whether they believe in God, almost 80% said no. I wonder how many of them think of themselves as atheists as opposed to agnostics? Here's the bad news. 79% of these eminent evolutionary biologists say they believe in free will (option A on the question). Even the authors of the study were surprised by that one. We anticipated a much higher percentage for option B and a low percentage for A, but got just the opposite result. One of us (Provine) has been thinking about human free will for almost 40 years, has read most of the philosophical literature on the subject and polls his undergraduate evolution class (200-plus students) each year on belief in free will. Year after year, 90 percent or more favor the idea of human free will for a very specific reason: They think that if people make choices, they have free will. The professional debate about free will has moved far from this position, because what counts is whether the choice is free or determined, not whether human beings make choices. People and animals both certainly choose constantly. Comments from the evolutionists suggest that they were equating human choice and human free will. In other words, although eminent, our respondents had not thought about free will much beyond the students in introductory evolution classes. Evolutionary biology is increasingly applied to psychology. Belief in free will adds nothing to the science of human behavior. There's one other surprise. 72% think that religion is part of evolution—it's an adaptation. One can only wonder what these evolutionary biologists think of themselves. Are they able to overcome their deterministic predisposition to God or are they mutants who lack the gene(s)? Maybe it explains why they believe in free will? Kind of a good news, bad news thing. But in truth, most of these people are not any more competent to speak of the evolution of behavior and particularly of H. sapiens mind then, say I'm competent to speak of microspinduals or some other such molecular machinery. I mean, we're all biologists, so we all know about biology, but we are also all specialists. But when it comes to human evolution, well, few respect that as a specialty. "Free will" is one of those ancient philosophical red herrings that is best simply ignored in the interest of clear thinking. If you chose your action "freely" (as if anybody can even state unambiguously what that means!) your action was still determined in a particular way, i.e. by whatever activity in your brain counts as the "choice". Saying this really gets you precisely nowhere. The problem is saying you *don't* have "free will" also gets you exactly nowhere. It's pretty boring either way. And I don't see how saying one has "free will" is "flunking a religion poll". Quite the opposite, because in many forms of Protestantism, predestination is the preferred myth. An animal placed in a situation of extreme pain will choose to leave if it can. If I am in a situation where I must choose - say, in the trolley problem - I will choose. It turns out that my choices are psychologically (and therefore most probably biologically, but maybe also or otherwise socially) constrained. The notion that "free will" means a totally unconstrained choice is something that we get from Christian theology, and it is incoherent. The idea ought to be instead that a free choice is one that is not constrained by anything other than our own internal states, and then it can be fully constrained. So it may be that Provine is thinking too much here - sure, if you are up on the philosophical literature you may be inclined to interpret this question thus, and deny there is free will, but in a court of law, for instance, a choice is free only if nobody else and nothing else but you determined the decision. While the authors of the paper have moved beyond Leuba's narrow definition of "personal God", I find their choices unsatisfying. I am a Christian, a regular church-goer, a convert from atheism to Christianity. 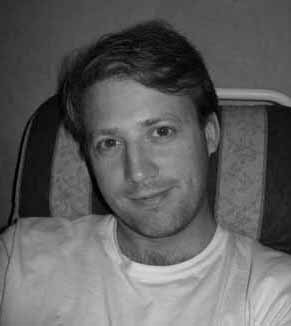 I had a profound enough "conversion experience" that I could (but wouldn't) call myself "born again". But I suspect that I would come out as a solid atheist in their survey. I believe in some form of a God, but not a creator God, not a theistic miracle-working God, not an old man sitting on the clouds. And, having read Spong (and led a Sunday-school class on one of his books), I'd say I'm not all that odd. I'm also curious about where many Buddhists and Unitarian would come out on their spectrum. The free will part threw me, too - I apparently do not have a definition of that term that resembles the definition used by current philosophers. Yeah, that. I have NOT been thinking about free will for 40 years (aside: what an odd thing to say the opposite), so I'm not surprised that any first-guess I might make in response to a question about it might qualify as a "flunk". If maggots can generate spontaneously, then thoughts can generate (arise) spontaneously in the human "mind." The maggots premise is false??? What determines the thoughts and ideas? They just arise, and feely??? It's worth pointing out that "free will" and "determinism" are not the same thing. The consensus so far seems to be that universe is not deterministic at the quantum level, and yet we still may not have free will. It's origins can be random or determined and still not "free". In any case (as John noted), the meaning depends on the context. - Even if non-deterministic effects applied it would just be the same as saying "someone who always has an uncontrollable spontaneous disorder has free-will"...that's not "free-will"
It's common in anti-science/atheist circles. Am I to understand that you do not think that predisposition to religion has evolutionary roots? Or at the least is an evolutionary side-effect as many believe? The fact that we are a thinking species has an evolutionary basis. Our complex brains evolved from the simpler brains of our ancient ancestors. We use our brains to create societies/tribes where cohesiveness and cooperation are beneficial to the group. Some of the strategies that we have tried over the past several hundred thousand years are things like treating women as inferiors, xenophobia, slavery, homophobia, and extreme brutality. Just because these behaviors existed in the past—and continue to exist today—does not mean that they have a genetic component. There is no gene that causes male chauvinism, for example. That's a behavior pattern that arose because it was useful in the past (perhaps) but we are abandoning it in the modern world. Similarly, the belief in common superstitions may have had a beneficial effect in binding the members of a tribe together but that does not mean that there's a gene for every kind of superstition. Furthermore, it does not mean that a predisposition to tribal cohesiveness and getting along with your neighbors has to be manifest in this particular way. Religion is just one of many different ways that we use to encourage bonding in our society. Patriotism is another and so are sporting events. We have a predisposition to form tribes but we do not have genes for religion or patriotism or NASCAR racing. I think that the relationship between free will and determinism is far more complex than the authors of the sutdy allow - a point that seriously undermines their work. As already pointed out, at the microscale the world is probably indeterministic but this provides no succor for free will. The more general point is that it seems quite likely that issues of free will and determinism are actually largely orthogonal. Behind the whole debate lie certain assumptions about the relationship between the mental and the physical that have dogged us for millenia. Someone should post Provine's arguments as to why Free Will is a *dangerous* ideology. He explained it in a debate with Phillip Johnson. From the title, I was under the impression that prominent evolutionary biologists lacked an understanding of the basic tenets of major world religions. This however seems to be something altogether different. I don't see how anything is being flunked here. This is merely a poll of philosophical dispositions. 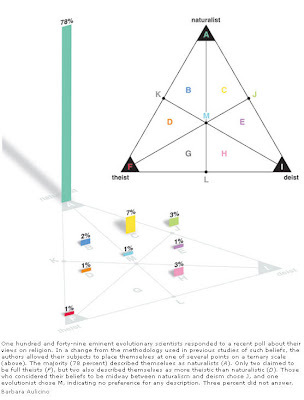 79% of atheistic evolutionary biologists believe in free-will according to polls, this proves that biologists don’t understand science and that the reason why biologists believe in evolution has nothing to do with evidence. There aren’t any biologists that value evidence, the reason why they believe in evolution is because they are biased towards evolution, not because of evidence. We know this with 100% certainty because they have no issue with denying repeatable experiments and direct observations to believe in free-will but have an issue with people denying the extraordinarily weak evidence supporting evolution, LOL. The reason why biologists believe in evolution is just because of their biases, they can care less about evidence, if they really did value evidence we would predict that they would be MORE CERTAIN that free-will is non-existent than they would be of evolution. Believing in free-will is MORE IRRATIONAL than denying evolution. The scientific evidence telling us there’s no free-will is based on direct observations and repeatable experiments. Almost everything in evolution is impossible to experimentally verify as accurate. So this means the scientific evidence telling us there’s no free-will is more concrete and stronger than the evidence supporting evolution, which is an extraordinarily weak theory, the very very very weakest theory I’ve ever looked at. From a strict empiricist point of view only conclusions drawn from repeatable experiments are to be really trusted as “true”….so many assumptions in evolution are impossible to experimentally verify, it’s just like a joke. “The Problem of Free-Will” argument is usually used against religion so of course the atheist-controlled media won’t come out to attack free-will believers like how they’ve attacked Creationists. I've already proven on my blog site that evolution the theory belongs in the same boat as crackpot perpetual motion machine ideas. Most biologists don't understand physics and engineering so who cares what they think? Biologists can imagine evolution working well in their minds just like how someone can imagine a perpetual motion machine working great in their minds, it's just fantasy and imagination. The media is atheist-controlled and biased that's why they have no issue with people questioning the neuroscientific experiments telling us that there's no free-will, General Relativity, Quantum Mechanics, or anything else in science but have an issue with people questioning evolution - a crackpot perpetual motion machine idea, because evolution is protected like a religious belief and not treated as another theory open to criticism and scrutiny. If you visit anti-science/atheist/evolutionist sites they don't allow people to criticize and scrutinize their clown crackpot idea because they know that they are wrong.